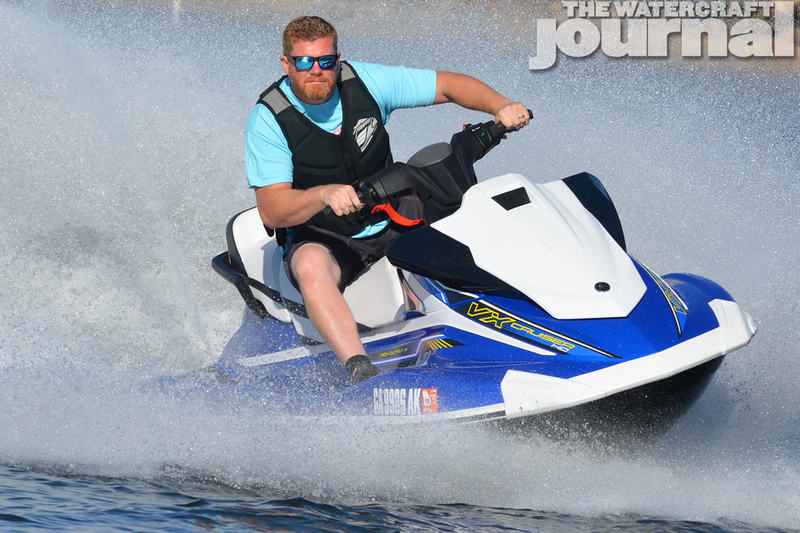 A Little Bit Softer Now: 2018 Yamaha VX Cruiser HO WaveRunner (Video) | The Watercraft Journal | the best resource for JetSki, WaveRunner, and SeaDoo enthusiasts and most popular Personal WaterCraft site in the world! “It’s $600 less?” I balked. Staring at the open windows on my computer screen, the evidence was looking me straight in the face. According to my observation, the 2018 Yamaha VX Cruiser HO is more equipped than the sporty VXR, yet is priced $600 less, at a budget friendly $11,299. “That just seems…weird.” Interestingly, the VX Cruiser HO is slotted as the highest tier of the VX platform offerings, while the VXR is sold as the lowest rung of the company’s performance group, despite so little separating the two. For me, it was trying to delineate differences between a pair of near-identical siblings. 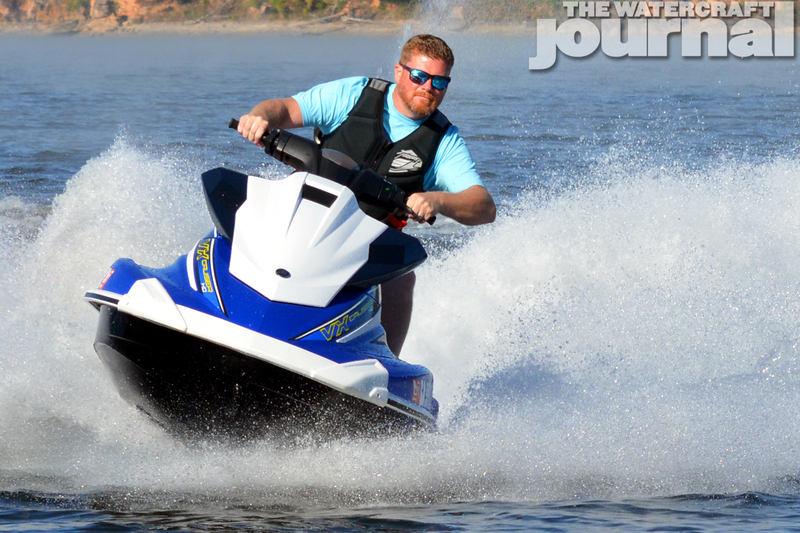 Both runabouts were propelled by identical powertrains, namely Yamaha’s bulletproof 1,812cc 4-cylinder High Output four-stroke marine engine. 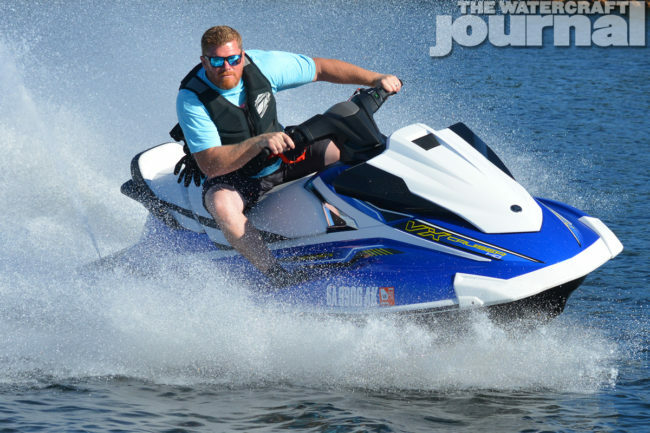 [By the way, why do we continue designating anything as a “four-stroke?” It’s not like anything is a two-stroke these days (besides the holdover SuperJet). 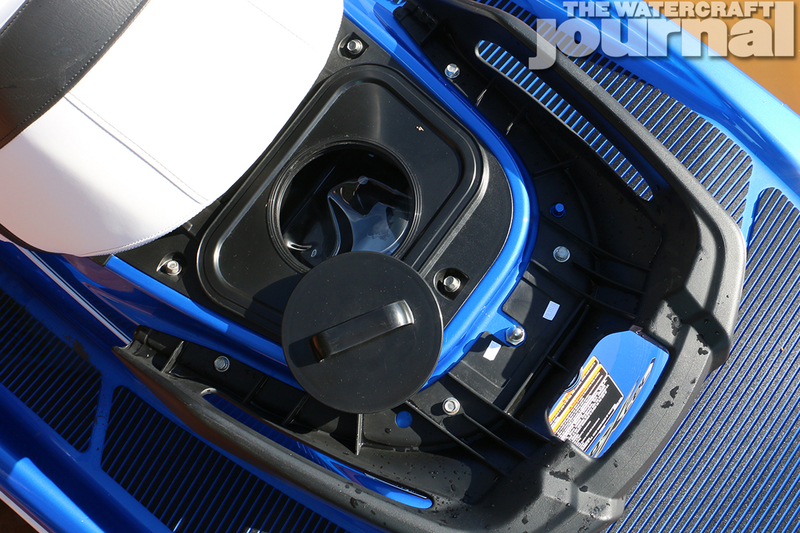 -Ed] Both shared the same 18.5-gallon fuel cell, 155mm jet pump and nozzle too. 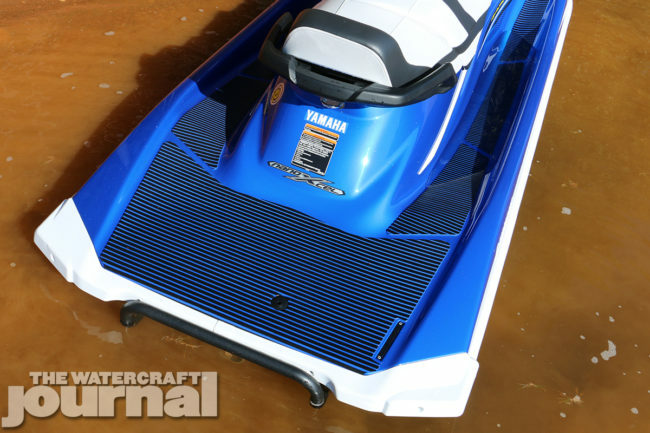 Equally, the pair rode on the same VX hull and deck, both made using Yamaha’s NanoXcel bonding material. They even had identical weights: 767-pounds. Heck, even the storage displacements were the same (24.6-gallons). The similarities didn’t end there: both came with a folding, padded swimstep and two-tone Hydro-Turf traction mats. 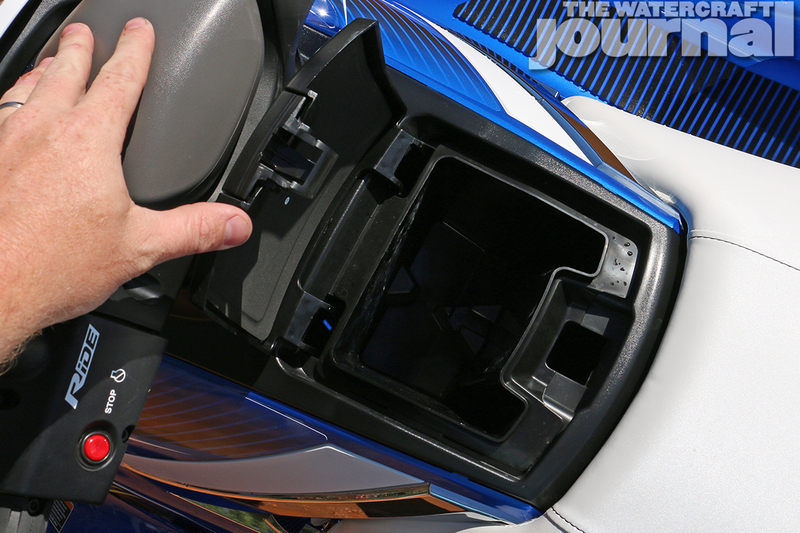 Of course, the machines also came with Yamaha’s RiDE dual-throttle brake and reverse system too. Most compelling was the fact that the VXR and VX Cruiser HO shared the same hull design as the stellar GP1800 performance craft that continues to dominate in both closed course and offshore racing. So then, what accounted for the difference in cost between the two? Cosmetically, the VX Cruiser HO comes in either Azure Blue Metallic or Grey Carbon Metallic, slightly more staid in its graphics and paint offerings, which makes sense given the intended audience. 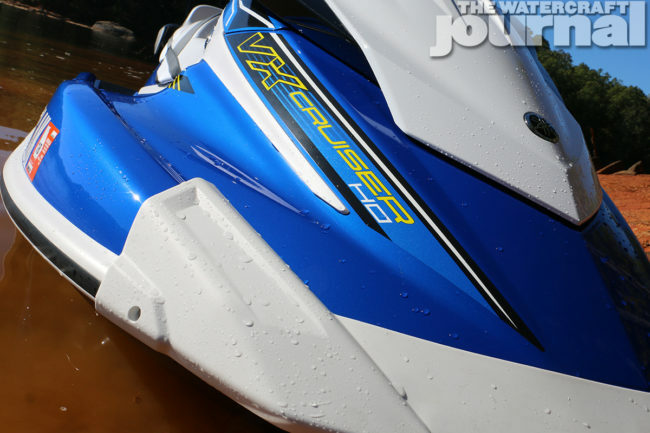 The racier colors and graphics are more suited towards the VXR and GP1800 crowd anyways. The VX Crusier HO does not share the same “Cylon from Battlestar Galactica” looking hood as the VXR and GP, but that of the other VX line. 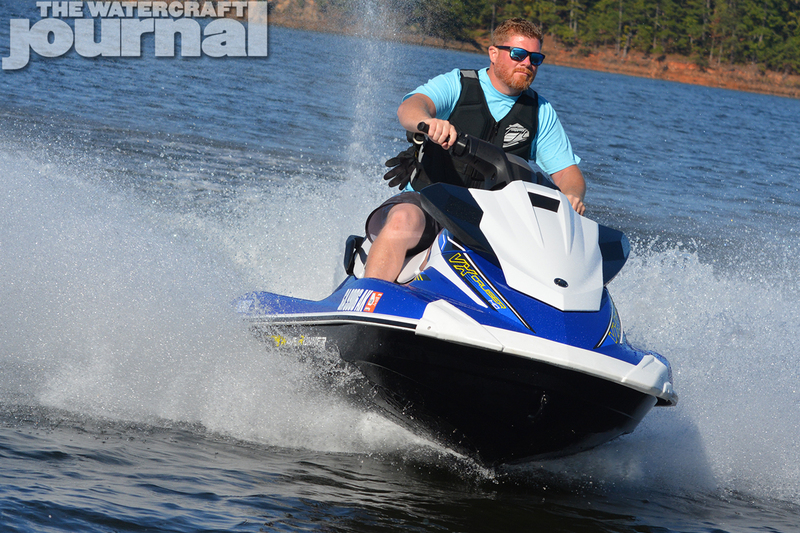 Of course, the major item is the inclusion of Yamaha’s bolstered Cruiser seat, giving the craft a comfortable, stadium-style sitting arrangement. The two-piece, tiered Cruiser seat is supposed to fit three, but is more suited for two full-sized adults. 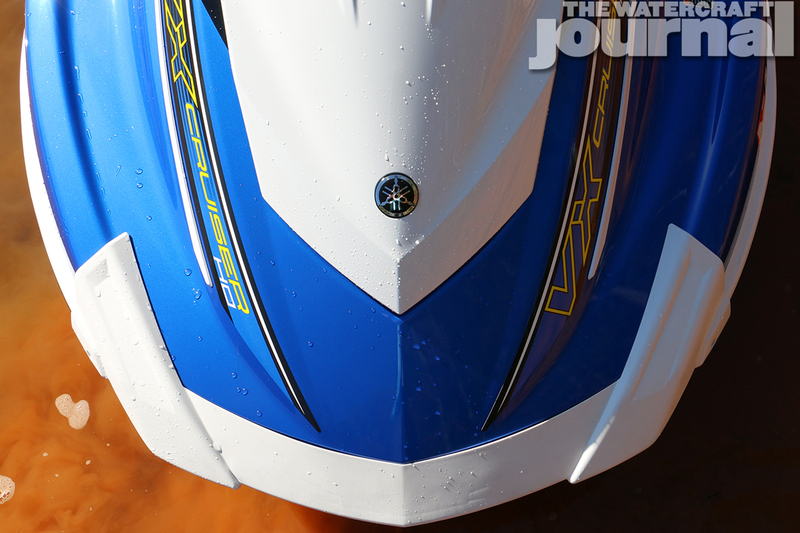 Although the VXR is smartly equipped with Yamaha’s fast-reacting electric trim control, there’s very little else. 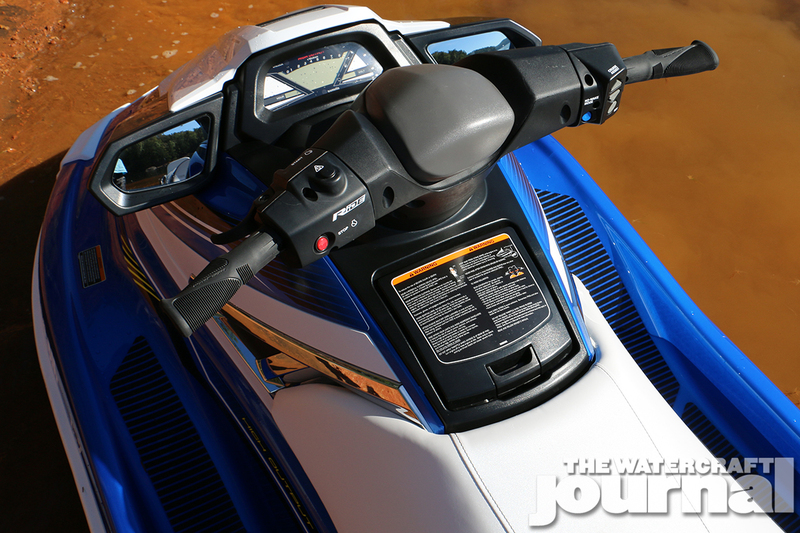 The VX Cruiser HO replaces the trim control with Yamaha’s Cruise Assist and “No Wake” mode controls on the handlebars. The dashboard is serviceable but definitely not flashy. 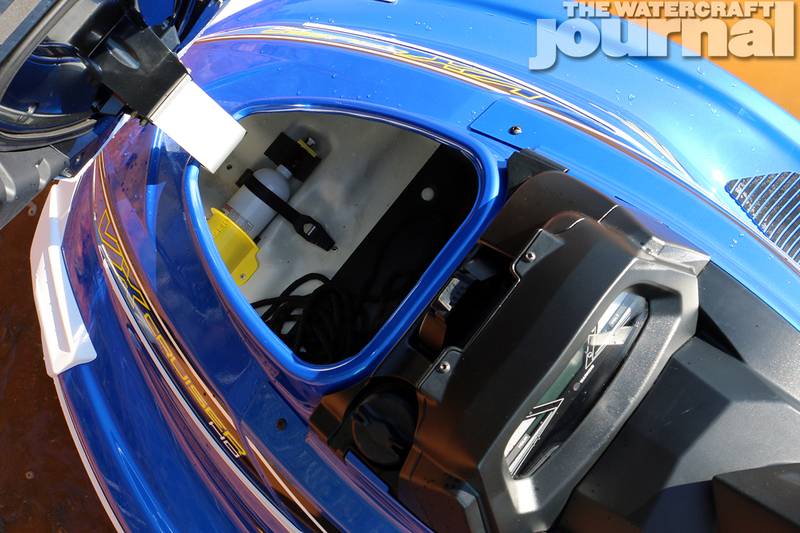 The mono-colored LCD screen gets the job done, providing large visible readouts of speed, fuel and rpm. 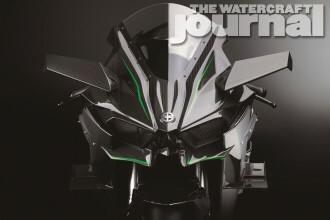 And like all VX-based Yamahas, the steering neck is fixed. No tilt or telescoping options here. Ergonomics are slight. The seat is wide, making sitting with legs and feet forward in the wells optimal for most riders over 6-feet in height. 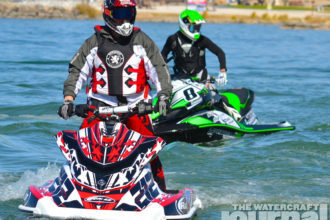 The steering neck is tall and angled enough to ride without slouching over. And despite its lightweight, the Yamaha fit-and-finish is superb, without any noisy chatter or rattling from loose hinges or panels. 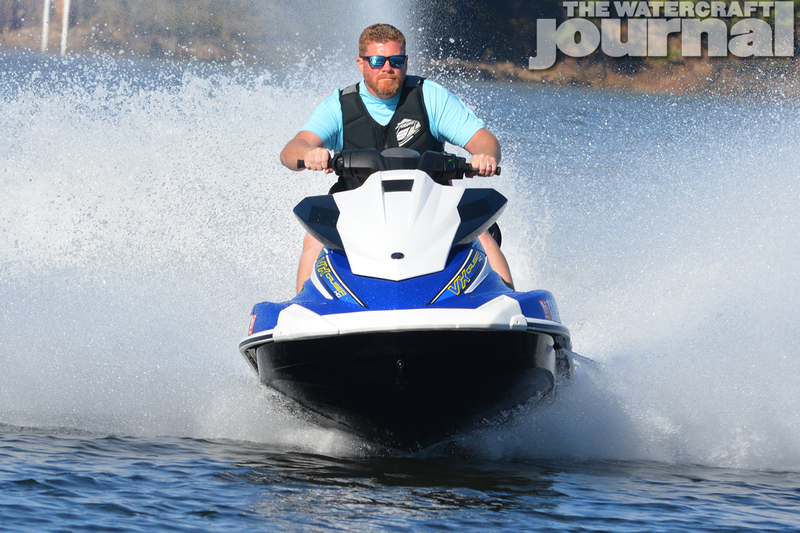 On the water, the VX Cruiser HO is just as sharp and snappy as the VXR, thanks to its shared use of Yamaha’s 180-horsepower 1.8L 4-cylinder and the lightweight NanoXcel hull and deck material – giving it all of the fun, playful performance of a Yamaha VXR with a few more bells and whistles. 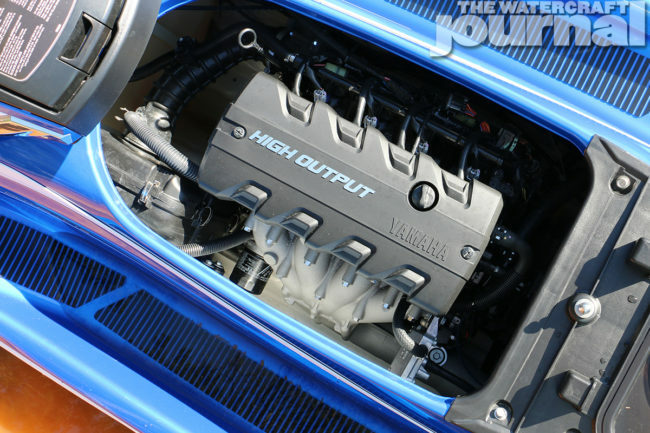 And because of Yamaha’s well-tuned 1.8-liter HO engine, it can run on either 87 or 93 octane. This, in turn, offers you basically a VXR with a comfier seat and cruise control for longer, more leisurely rides around the lake. 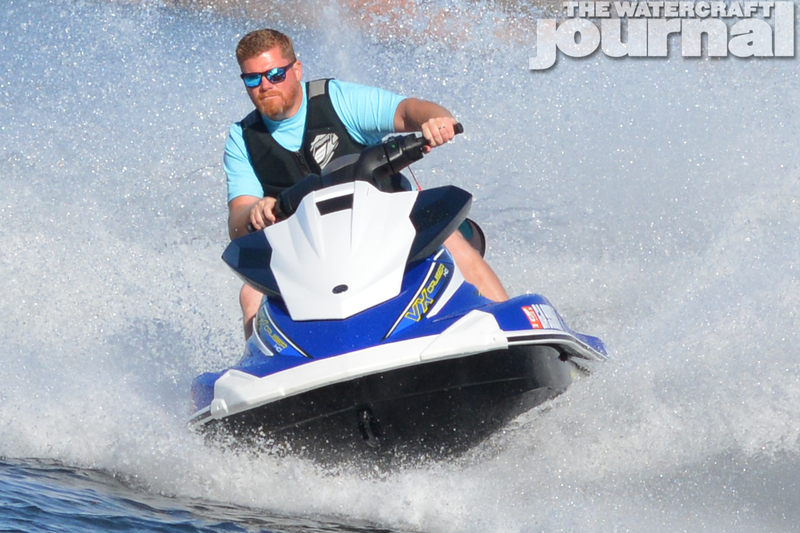 Best of all, it tracks true without any bow steering or hunting, regardless of the surface conditions. The Yamaha’s superior fuel economy and the generous fuel cell means you’ll be riding all day before needing to stop off at the fuel dock. In fact, this was the case during our days testing the VX Cruiser HO. No matter how long and hard we laid into the throttle, we struggled to put a dent into the fuel gauge. 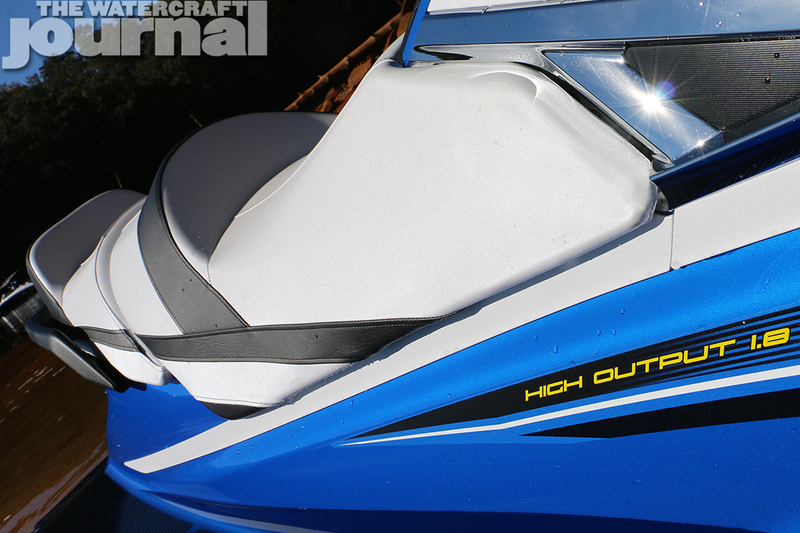 The craft itself is stable and mildly mannered – no tipsy, precarious reboarding here, especially with the wide, flat rear platform. All in all, the 2018 Yamaha VX Cruiser HO is a great all-around cruiser that gives dad all the excitement he could want, while retaining fuel economy, and plenty of oomph to tow a raft or wake boarder.